During the construction of multiple residential dwelling it became apparent that a historical gas works had previously occupied the site. 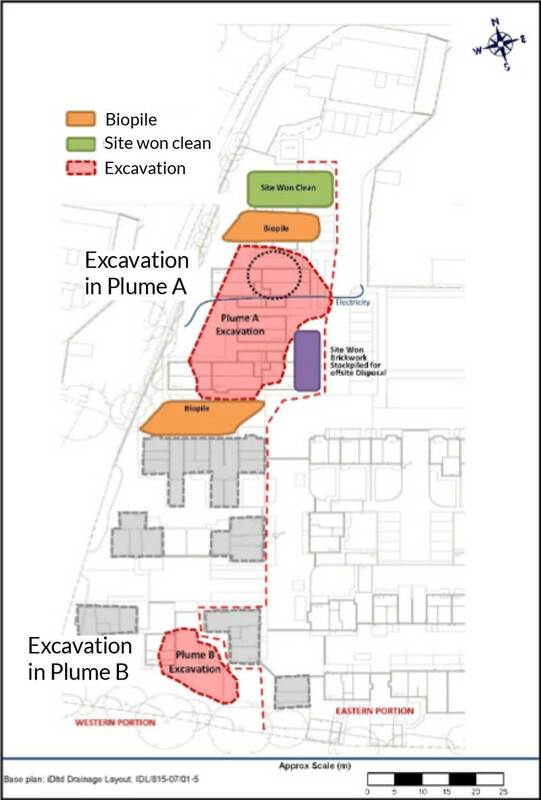 A targeted site investigation needed to be completed quickly to identify the areas requiring remedial action, enabling construction to continue in plots outside of the plume. A combined remedial strategy was required to address soil, LNAPL, DNAPL and dissolved phase contamination. The implementation of the treatment had to be completed around partially completed housing and live underground services. The remedial works had to be completed quickly in a manner as to not impact the build program. The strategy needed to provide appropriate protection to both human health and controlled waters. The need to respond and act quickly required excellent communication and good working relationships to be established between the consultant, stakeholders, regulators and multiple specialist remediation contractors and suppliers. The impacted materials within the unsaturated zones within Plume A and B were excavated and placed in a biopile for onsite treatment (Figure 1). Nutrients were added and the biopile was turned until remedial targets were achieved. The soils were then backfilled under the CL:AIRE Code of Practice. Prior to backfill with the remediated soils, ORC Advanced Pellets were added to the base of the excavation. This provided a source of dissolved oxygen for up to a year, stimulating the growth of an effective aerobic biomass and accelerating the degradation of the petroleum hydrocarbon contamination. REGENESIS injected PlumeStop, a micron-scale colloidal Liquid Activated Carbon substrate along the western margin of the site via direct push to protect the offsite surface water. PlumeStop creates a subsurface activated carbon filter which adsorbs the contaminant influx, which is then degraded by the microbial growth on the carbon biomatrix. Biological degradation was also accelerated through co-application of ORC Advanced and the presence of the pelletised ORC placed in the base of the excavation upgradient, providing a controlled release of oxygen. Where LNAPL and high dissolved phase concentrations were observed, a network of injection boreholes were installed by Rake Remediation/REGENESIS. Many of the wells were installed by removing suspended floors and lifting in a mini-rig to complete the drilling beneath partially constructed dwellings. Through these wells, multiple applications of RegenOx were completed. This in situ chemical oxidant was chosen as it was safe to handle on this busy site and would not corrode services installed at the site, nor would it be detrimental to the concrete footings. Following the ISCO, ORC Advanced slurry was injected to enhance the natural attenuation (ENA) of the residual dissolved phase contamination to low levels. 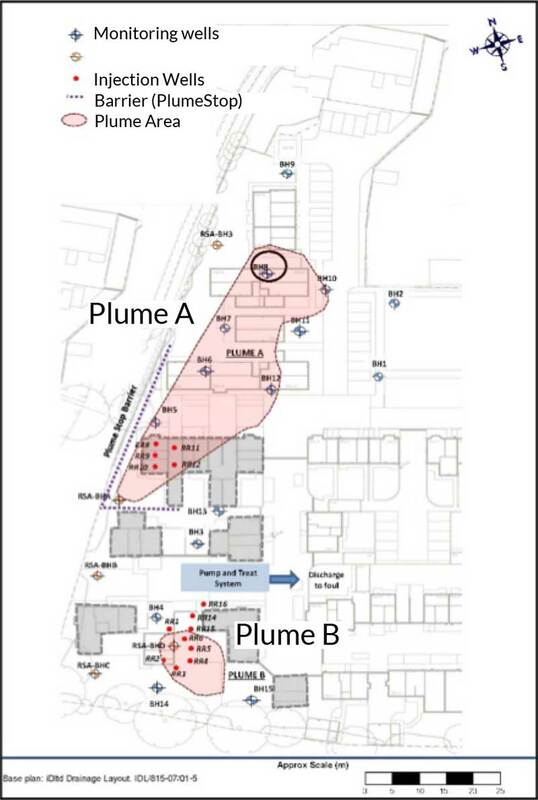 In Plume B, high levels of contamination in the form of both L- and DNAPL were encountered. This was removed using a P&T system augmented with PetroCleanze, an inorganic surfactant that uses a high pH, carbonates, silicates and partial oxidation to remove contaminants from soils. The PetroCleanze was injected to produce a temporary desorption event, which once observed, allowed the P&T system to be switched back for a short period to remove the contamination. This process was repeated three times to maximise the efficacy of the P&T and shorten the treatment programme. Once the NAPL was removed, multiple rounds of RegenOx were completed, followed by ORC Advanced via injection through wells. Long term groundwater monitoring programme was put in place to monitor the effectiveness of the clean-up. 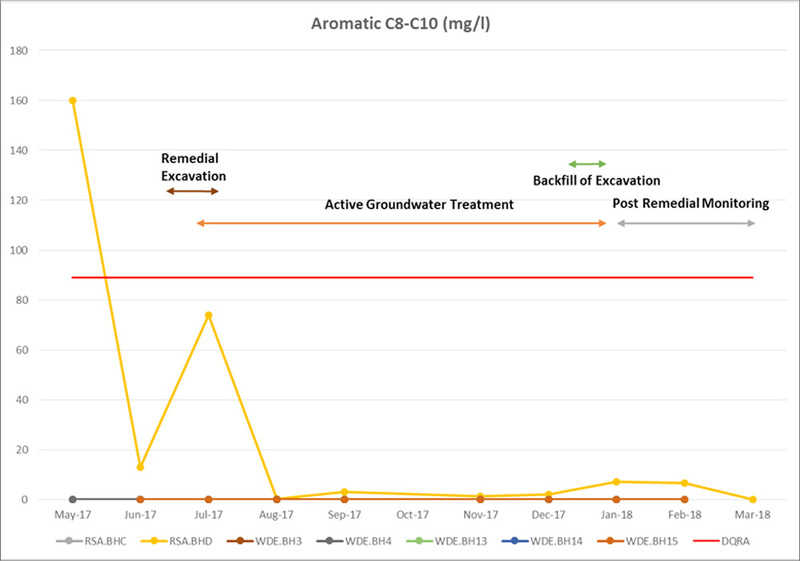 The following graphs (Figures 7 and 8) show the variations in concentrations for selected priority contaminants of concern over the monitoring period for Plume A and B. 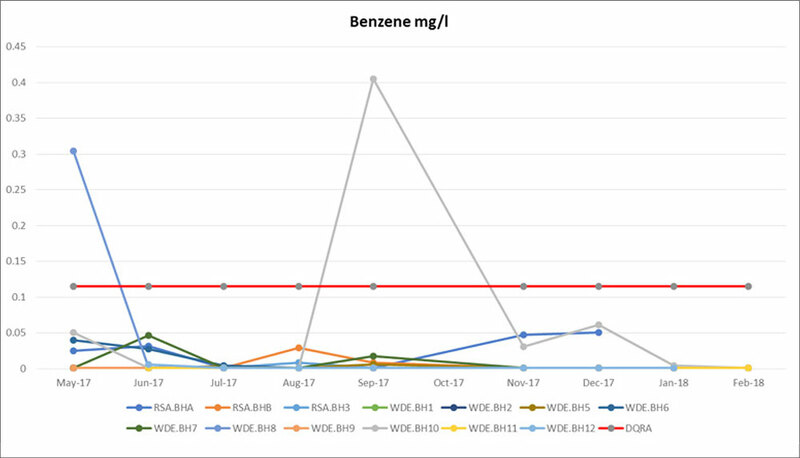 These show a marked reduction in the hydrocarbon dissolved phase concentrations over time, with compliance achieved with the remedial criteria. Contaminant mass reduction to below remedial targets in the soil and groundwater within 6 months. Protection of onsite and offsite receptors. Written confirmation by the Environment Agency that they ‘agree with (the reports’) conclusions’ and that ‘development may proceed’. Remediation completed on a tight budget – as remediation had not been foreseen by the developer. Ex-Situ remediation of soils and their reuse on site under the CL:AIRE CoP avoided offsite disposal of ~800m3 to landfill. In situ enhancement of the P&T system, minimising the time, cost and volume of abstraction required. By combining the technologies intelligently, both simultaneously and sequentially, the programme length was minimised – allowing construction to continue within only 6 months.